Does the title of the blog sounds somewhat familiar to you, then you are just at it. 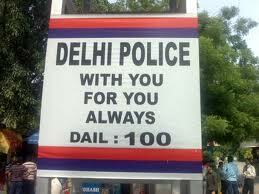 It is our own Delhi Police's (DP) by-line. The way we associate Nike with the by-line 'Just Do It', Delhi Police thought off, coming with their own set of literature to impress the public with their antiques. Hence the famous piece 'With You, For You, Always' came to fore. Even being at the opposite end of the spectrum, with their actions in contrast to the meaning of the said byline, but the Public Relation team of DP left no stones unturned to make sure that their by-line stood next only to Nike's when it comes to people's recognition. All Police station's boards, side of the white Maruti Gypsies, road barracks, kiosks, boundary line hoardings at Firoz Shah Kotla, stepny covers of scooters, inside Sulav Sauchalayas, everywhere you would find this line being promptly imprinted. I heard now the PR team are planning to gift T-Shirts with this line to all those hapless chaps they pick up in the name of interrogation and beat them black and blue to see to it that they confess to the crime they haven't done. After all who cares who has done the crime as long as we have someone confessing for it. Apart from the gross lack of administrative sense, the DP team time and again voluntarily proved, they lack common sense and other aspects of education. I guess DP HR department should patent their selection process, so that they can earn millions when students from different Business schools across the world would beg to know the art of recruitment : "How not to recruit craps for your organization". When Mr & Mrs. Kaul (an aged couple) were found murdered in their flat, our Delhi Police was promptly pressed into service to catch hold off the culprit.Ever agile DP team got into action without delay. Huge road block greeted the investigating team when they failed to find any eyewitness. Due to the serious lack of IQ, as expected our team failed to comprehend the motive behind the murder even. Now DP team, who are not very fond of defeats, get into their usual business of framing an innocent, the act where they are self proclaimed masters. The blood trail they found in the room finally led to the nephew of the deceased, as the team saw blood marks on the shoes of the said chap. As the nephew is the person who first saw the dead bodies and eventually called the masters to take charge, it was highly possible that his shoes might have come in contact with the blood on the floor. Knowing this fact could go against them in court, our DP team promptly arrested the nephew and beat the hell out of him till the point he confessed to the crime, the cloths he was wearing, other sundry items and even the virtual murder weapon. Now do you think, is blood group AB a result of a mixture of blood group A and blood group B ? At least some Delhi Police sleuths think so. But for this lack of knowledge of elementary biology, these cops would have got away with their devious plan of planting evidence to solve the murder case and eventually framing an innocent man. When the cops who were investigating were grilled severely by the defence lawyer, it came to light that, in a desperate attempt to crack the double murder with no eyewitness, these policemen planted blood group AB on the weapon of offence, which they believed would explain the killing of a man and his wife who had blood groups A and B respectively.Hinting at a deliberate attempt made by the cops, to falsely implicate the accused the honorable High Court said : "It is apparent that some overzealous police officer has planted blood on the knife because, when blood group A is mixed with blood group B doesn't make blood group AB, which surprisingly thought the other way by few cops with the knowledge base of the highest order. It is suggested the cops be given sound counselling and if possible a lesson or two on elementary biology." The accused is acquitted with all respect and our DP team returned to their base licking their wounds and few books on biology in their hand. In the infamous case of Manu Sharma our DP team was at it again. This time they didn't tried to frame someone but goofed up every possible investigating procedure came in their way. When they felt everyone starting from Sonia Gandhi and down are pissed off with them, they send an SOS to the headquarters to rush-in a guy with a bit better experience in handling a high profile murder cases. The saviour was deported in a hurry and once he was there, he advised all to start from the scratch, looking at the complexities of the case. When investigating a crime what is the first thing to be established? He asked. Oh yes the gentleman at the last row. What is that, you didn't raise your hand because you know the answer but you want to go to the toilet instead. Off you go, but don't forget to wash your hands. Now as it seems nobody knows the answer, let me answer it myself then, said the saviour. The first thing the cop does is to establish that a crime actually being committed to begin with. Now what is the crime in this Manu Sharma-Jesica Lal case, can anybody answer me ? The premises was not licensed by the relevant authorities to serve alcohol were in fact doing so, in clear contravention of Excise Act 1927, Subsection 3 Para 2, came a prompt reply. Bull's eye. Now as the crime is established (Serving unauthorized alcohol), lets go to the dubious claim that a fire arm is discharged at the said premises. It's really a dubious allegation indeed as no firearms are being recovered from the place, said a top cop sitting at the front row. To make matters worse there is a suspicion that there were actually two unrecovered firearms there, he added. This makes the case doubly suspicious. Practically a whole arsenal gone missing. The two fire arm theory goes on to suggest that there could be two shooters: One Manu and another Sharma, announced the intelligent saviour. Now where all this two-in-everything argument leads us to? Simple. It proves conclusively that everyone present was blotto on unlicensed alcohol and seeing double. Brilliant, Brilliant yelled the saviour followed by a huge round of applause by all present in the room. If further proof were needed that a crime actually been committed (consumption of unauthorized grog) it is supplied by tow-gun, two-shooter hallucination, added the saviour. Ahh.., our friend from the toilet is back. When guys try to achieve more than what they deserve like our Delhi Police, then at the end of the day it is the Human Rights that goes for a toss and Democracy a huge causality. Actions speak louder than the words. It is expected that our Delhi Police Cops should get into some real credible action than going around convincing people with their With You, For You, Always Funda. Amen! !